Welcome to our home! If you are new here, I hope you are visiting from the Christmas Open House Link Party hosted by Brenda at Cozy Little House and Debra at Common Ground. If you've been here before, I'm so glad you are joining the party! I just love parties, don't you?! I have been decorating for Christmas since the day after Thanksgiving. We like to put our tree up a little early so that we have longer to enjoy it. Of course, if we celebrated the actual 12 Days of Christmas, we could keep it up until January 5th. We used to have one of those tall, fat trees that took up most of the room. A few years ago, we decided the tree needed to go on a diet, so we exchanged our large tree for one of the thin pencil-style trees. We've been happy with it. When the kids were little, I would decorate everywhere with everything...Santas, snowmen, reindeer, mistletoe, garland, etc. Over the years, I've dwindled the decor down and each year put out less and less. I found that it was so much more fun putting it all out and not so much fun putting it all away, so I adopted the "less is more" mentality. This year, I decided to use primarily silver and gold, with some touches of red thrown in here and there. The dining table has a little bit of black, which goes perfectly with silver and gold. 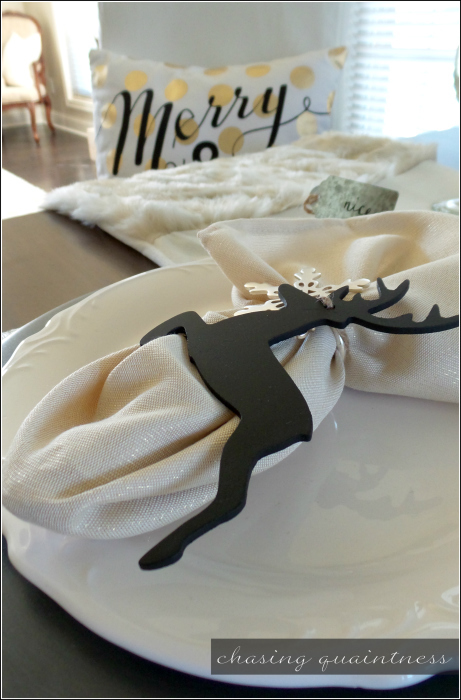 These little reindeer are chalk-coated and serve as place cards. Since I have my little place card stumps, I tied these around my napkin ring. Prancer stands proudly in the center of the table, guarding each place setting and those glasses that I decorated. 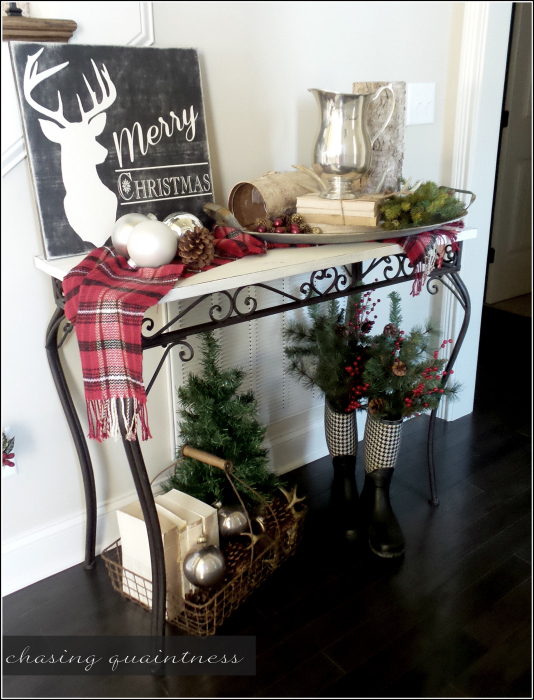 The entry table has more Christmas decor than any other part of the house because it is the first thing you see when you walk in the door. I wanted it to be festive, bright, cheery and welcoming. This space stays flooded with light, even on cloudy days. My decorations are pretty basic and simple, but they work for this house...and for us. I do have a couple of other small things scattered about, but they aren't worth mentioning, so I will let you see my snobby reindeer on the fireplace hearth. I don't know what their problem is...they've had an attitude ever since I brought them home! I'm so glad you have visited today and hope you will come back again soon! I hope your holidays are filled with peace and blessings! Just beautiful and simple...I love it, Benita. Thank you Tina! I love Alabama also....their voices harmonize so beautifully together! Hugs sweet lady! Everything looks so pretty on a white backdrop. What a great welcome when you come in the door of your pretty home! Your new home is looking very cozy and comfortable and I love your Christmas touches. So pretty! Gorgeous, exactly what I would expect from you, beautiful Benita!! Awww, thank you so much! Hugs!! Your home looks stunning, Benita! I love your touches of Christmas...just enough, but not too much. So elegantly appointed. touches of humor. whimsy. even adorable snobby reindeer! LOL! love the tartan scarf welcoming all who come forth. i'd say nigh onto perfect dear bean! Thank you so much Miss T! And you know, I would be the one to have to buy the snobby reindeer...LOL I like that pop of color with the scarf also...something bright and festive when you come in the house! :-) Love and hugs to you! Beautiful tree and home. Love the lighter colors and your entryway is fabulous. I hope you are having a wonderful pre Christmas season. Hugs!!! Thank you so much! I like the pops of color with the neutral colors…keeps it simple for me. I hope your Christmas season has been wonderful too! Hugs!! I think it's perfect. I adore the color scheme. My favorite piece has to be the tree topper...so creative!! Thank you so much Julie! I've loved that tree topper for the last few years but wouldn't buy it. This year, I took the plunge....something a little whimsical! :-) Hugs sweet friend! I love the winter whites also but don’t know if I could do it looking at all that snow. I would definitely need some color. And yes, I went with some whimsy on the tree topper this year. Kirkland’s carries these and they’ve had them the past few years, but I wouldn’t buy one. This year, I did. They also come in black. I thought the plaid would tie in with the scarf on my entry table! So yes, Kirkland’s should ship to Canada! :-) Thank you so much sweet Kari!! Those boots! I just love them. Thank you so much Carla...me too and me too! :-) Hugs and Merry Christmas!! 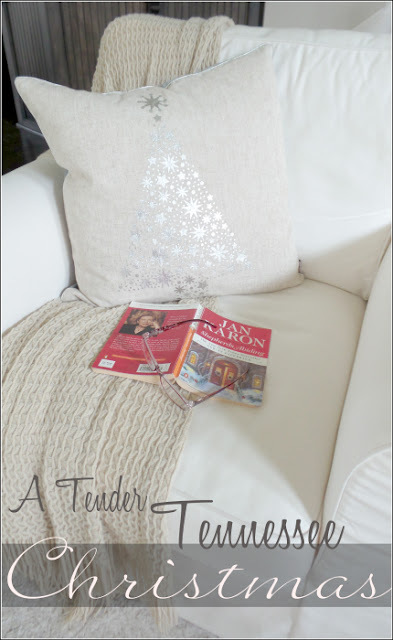 i enjoyed this enchanting look through your Christmas décor and I love your choice of silver and gold. Your home has a genuine feeling of embracing your family with love and that in my book rocks! Thank you so much Vera! I wanted to keep it simple this year. 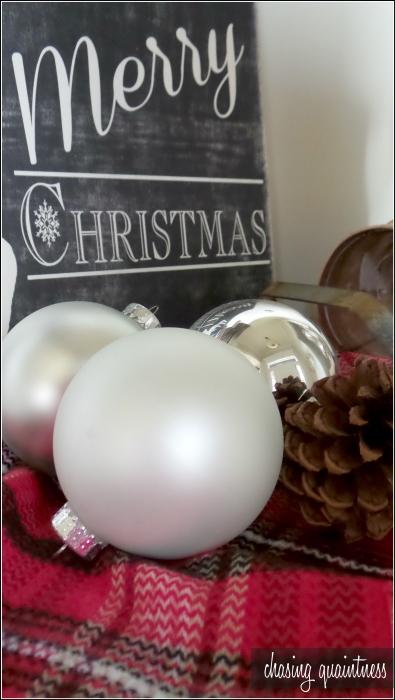 I’ve never used silver and gold in Christmas decorating before, so I thought I would give it a try this year! :-) Thank you so much for visiting. I do hope you will visit again! Hugs and Merry Christmas!! 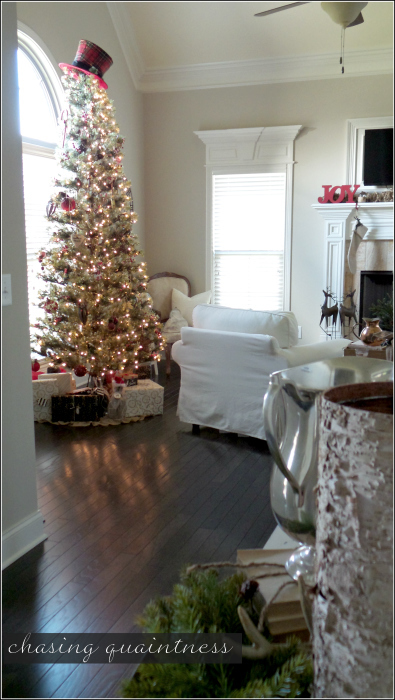 Your Christmas decor looks beautiful and elegant, Benita, you really have a great sense of style. Less is more in so many cases and I agree, putting things away in January is tiresome. I really love your tall skinny tree (I've always dreamed of that for my 'physical self'! lol! No such luck. Maybe someday I will have one in the family room. Space is hard to find here. 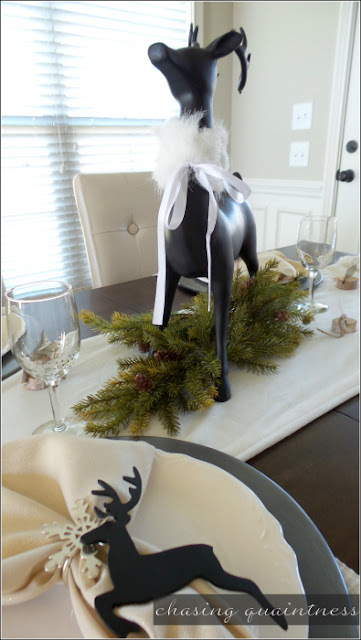 Your table is gorgeous...love the reindeer and gold accents. Everything is so pretty!! Thank you so much Jane! This house is small, so even with fewer things out, it looks full. Oh, I so wish I could be the tall, skinny tree also...LOL We have room in the bonus room upstairs for another tree, but we just got all of that furniture settled into place and I did not want to shift it all around....so only the one tree. I had a white one years ago and would love to get a small white one for the bonus room...maybe next year. Thank you again so much! Hugs sweet friend! I'm FINALLY feeling better. Now it's time to clean the house, so I can take pictures too. And thanks for mentioning the war. That's the other reason I haven't been on here. Scary stuff. You're so right about black looking great with the gold. It really pops. I wish we could switch out our bodies to be tall and thin like we switch out trees, but alas, muffin tops are here to stay. I see you changed your header! Nice! Yes ma'am, just wanted a small change at the top. The other one was boring! :-) Thank you! LOVE those vintage cars you've been sharing on IG!! Perrrrrrrrrfect for your beautiful new home. Sooooo perfect. Love that red plaid top hat, as topper for your tree!!!!! You are so "ding-dang-dern" clever, to think of something like that!!!! Happy, happy Holidays, Christmas, Yule, whatever!!! Thank you so much Tessa! LOL…I’ve been that way before…waaaaayyyyyy past the holidays and still looking at a tree! 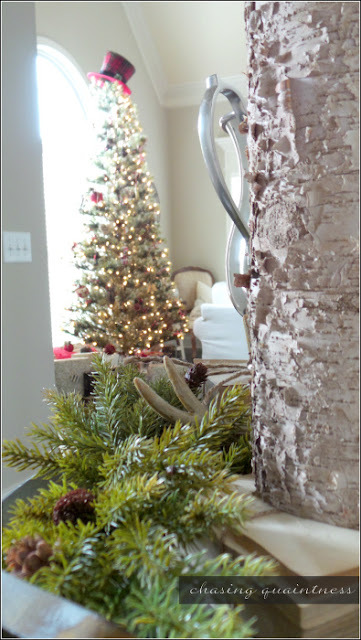 That’s when the ideas to decorate for a year-round tree start running through my head. I like the less and less….it is just easier to put up and put away. Thank you so much! I wish I could take credit for the idea of using the hat, but I bought it at Kirkland’s...it is their tree topper. They have them in plaid and in plain black. Thank you again and I hope that you have a most wonderful, happy, blessed and Merry Christmas!! Love and hugs to you!! Beautiful, Beautiful, and did I say Beautiful? Your home is beautiful!! 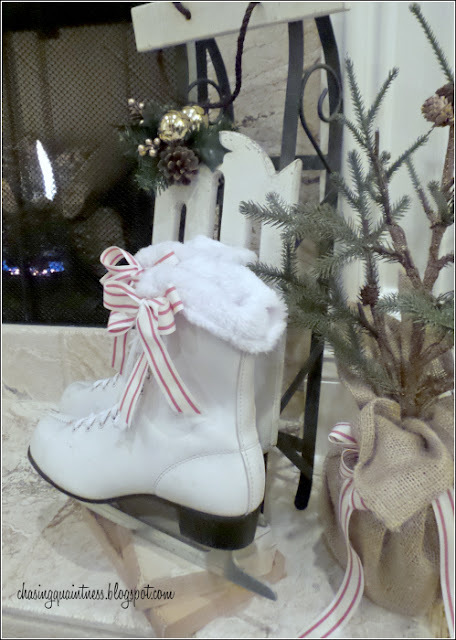 Love the pops of black, and love how your gum rubber boots made another appearance, I love them in your decorating! And decorating...ah, I still pull out all the bells and the whistles...well, there are no whistles - but I am up to my eyeballs in bells...and glitter, did I say glitter?